This course introduces you to what conflict is, the different types of conflict, reasons why conflict can arise, and various conflict handling styles. Experiencing conflict, whether with your colleagues or family members, can be a real cause of stress. This free online course on Conflict Management and Negotiation will give you an overview of the fundamental types of conflicts that occur at work and at home and provides important conflict management methods. The key focus of this course is to help you effectively deal with disagreements and avoid common mistakes made during negotiations. The course begins by explaining what conflict entails, the various types of conflict that can occur and the levels of conflict that are most effective for high performance. You will study potential root causes of conflict arising within a workplace and the positive or negative outcomes that can arise from conflict. 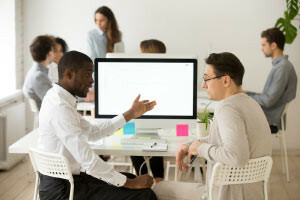 You will then learn multiple techniques on how to resolve organisational conflict and the most common approaches people adopt for handling conflict. The course also introduces you to the five stages of negotiation and common negotiation strategies, as well as, how to avoid common mistakes that could negatively impact the result of your negotiation. Lastly, you will learn about third-party negotiations and alternative dispute resolutions recognizing when it is time to enlist a third-party negotiator, and you will also learn about ethics, negotiation and the negotiation skills for conflict management. This free online conflict management course will be of great interest to professionals working in areas such as conflict management, negotiations, and human resources. It will also be useful to anyone who would like to better understand the important and stressful types of conflict that can occur. So why wait until it's too late? Check out the course now and start learning really useful conflict management and negotiation skills today!